Automatically discover endpoints and deploy software for fast onboarding. Scan network through active directory, workgroup, IP range or domain list. Deploy any .exe, .msi, or .mst package to discovered endpoints. 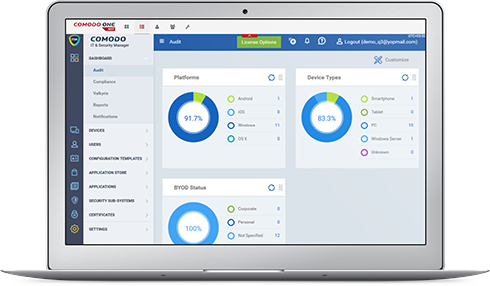 Comodo ONE automatically Identifies hosts and devices on a network. For example, it provides a list of hosts that respond to pings. Automated network device discovery tool provides a dynamic list of network devices. Obtain fault, availability, and performance metrics by polling device MIBS via SNMP monitoring. Identifies active SNMP objects and instances on SNMP enabled devices. Simply provide the list of IP addresses, range, or subnet along with SNMP credentials and the Comodo One Network Discovery Tool will automatically identify all the devices on your network. Use SNMP monitoring to create a detailed network inventory of SNMP enabled devices on your network. Network Assesment provides a scalable approach to help organizations understand the complete overview and status of their network. This helps you identify the performance of the processes and provides solutions to battle against security vulnerabilities. The Network Assessment from Comodo gives a clear visibility to the Managed service Providers on the current network of their new clients. The Managed Service Providers would be able to comprehend the intensity of potential vulnerabilities in new customer’s network. To top it all Comodo’s Network Assessment is available for free. Do you need any more reasons to choose Comodo?? Why Network Assessment is Free? Convey2Web, LLC is a managed services provider based in Middletown, Delaware serving the IT needs of the community for the past 10 years.